The company Pajot is a family business which was founded in 1910 by Alphonse Pajot. First orientated on general engineering, the company Pajot took a turn in 1920, when Alphonse invented Pajot air hammers. Since then Pajot has not stopped developing its offers and products in an effort to leave its customers even more satisfied. The Pajot company is now managed by the fourth generation who offers new and used equipment for sale and for hire. Thanks to its experience, the Pajot company is able to offer its customers sound advice when it comes to choosing equipment that is suited to their needs as well as technical maintenance, in France and abroad. 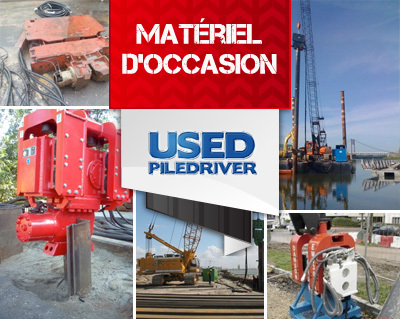 Today our company specialises in HIRING, SELLING (new and used) and BUYING BACK equipment for VIBRATION, PILE DRIVING, SILENT PILING, EXTRACTING and FORMWORK for all kinds of profiles: sheet piles, tubes, H piles, wooden piles, concrete piles etc.